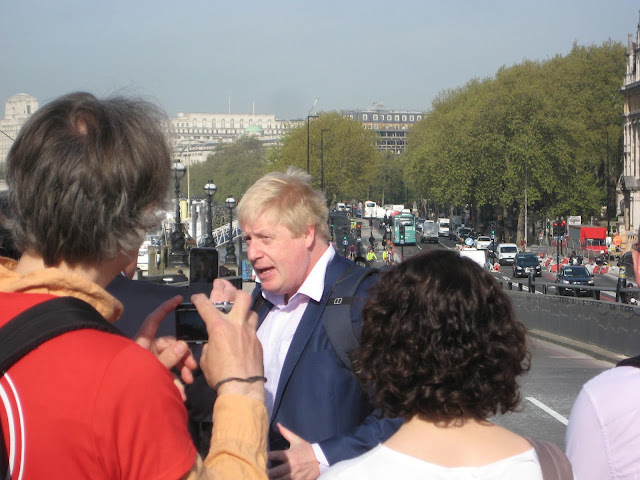 Five years ago today the video below was issued by London Cycling Campaign as part of a consultation exercise with its members to find out what their preferred campaign might be for the 2012 London Mayoral election. In it, I argued that the key first step towards mass cycling is the provision of high-quality segregated cycle tracks on main roads. This overwhelming support this concept gained from the membership led directly to the Love London, Go Dutch campaign, the commitments secured from Boris Johnson, his Mayor's Vision for Cycling, and the system of quality segregated cycle tracks we now see starting to be developed on the main roads of London, so conspicuously enabling all-abilites, 'eight to eighty' cycling in places where this had not be dreamed of before. So I am proud of this. This is not to decry the proposers of the other three possible campaigns mooted in the video. They all make excellent points. But it was a matter of what was the best, most effective strategy for us to pursue at the stage we were at (and largely still are) in our development of a utility cycling system and culture in London. In the video, the first proposed theme, that of getting larger numbers of children cycling to school, was an objective, not a mechanism. There was no contradiction or competition with my proposal there because the one was necessary for the other. A very large number of schools are only accessed on major roads that would need segregated cycle infrastructure in order to get kids and parents cycling to them. Other schools in other places would require different treatments of the roads around them. But putting a social result of good cycling infrastructure forward to be the campaign itself was not quite logical. And one might be struck by the fact that for a demonstrator background to that bit of video, a temporary 'artificial' situation was used, of the FreeCycle (then called SkyRide) ride round London where children do indeed come out cycling in large numbers because the roads are closed for a few hours. In contrast, the background to my segment was the real, permanent situation created by the Torrington Place cycle track in Bloomsbury (which was doubled in capacity last year). The third proposal, for 'unwinding urban gyratories,' also contained a fallacy: the idea that merely making these major roads two-way would be of great benefit to cyclists and pedestrians, would actually transform them into pleasant places to be, without measures to also reduce the total motor traffic. I've dealt with that one here, and I think we've moved beyond this concept in policy terms now. 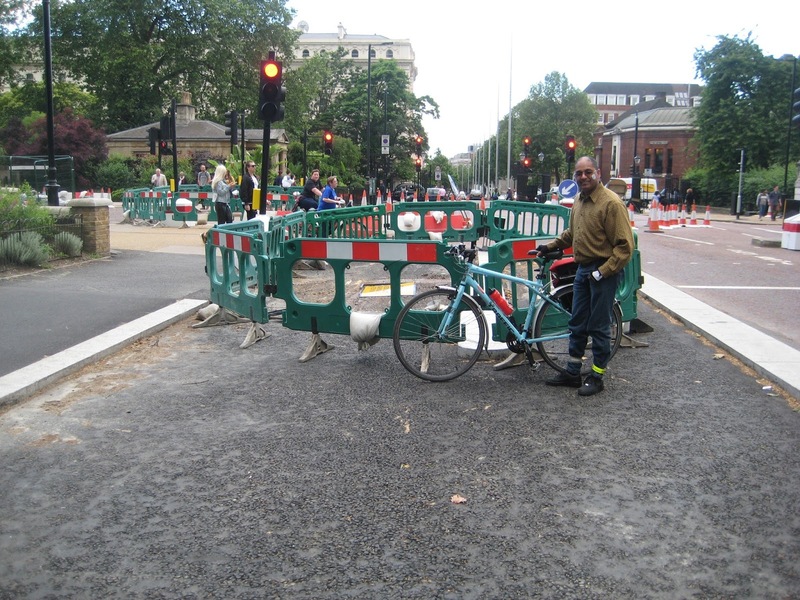 I pointed out long ago how, where in it was tried in practice, for example in Piccadilly, the simple unwinding of gyratory systems proved to be no good for pedestrians or cyclists. Then the final proposal, Love thy neighbourhood, for a campaign for area-wide traffic motor removal schemes through modal filtering, did of course advocate a policy that is essential to creating a truly people-friendly city. But it can never be the primary solution for cycling on the road grid that we already have, because we can't get rid of all the motor traffic arteries that most real cycle trips will need to use for part of the journey. A comprehensive application of Love thy neighbourhood principles would, at best, lead to a series of separate small districts in which cycling was an attractive option, cut off from one another by still-hostile main roads. Then, proposing this as the first step from where we were, also, I hold, badly underestimated the huge political challenge of creating these calmed neighbourhoods in a political climate where most people cannot imagine everyday transport by bicycle and believe in general that having all possible routes for motor vehicles open is a good thing. The Quietway element of The Mayor's Vision hit precisely this snag. It turned out, as I expected, that it was actually poltically far easier to carve space for cycling out of main roads by physical segreagtion, than it was to create routes on minor roads by closing rat-runs. Those who depend on car transport typically only think their street should be quieted. The next one, and the next one... they should all be rat-runs to allow them to get places fast. This is a fundamental problem. We have seen that there is not yet political consensus on the general desirability and practicality of low-traffic residential areas in London. 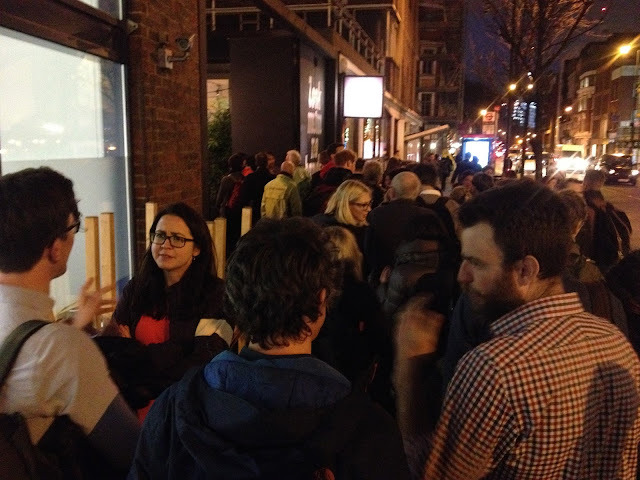 We've seen that again and again, in Lambeth (Loughborough Road area), Camden (West Kentish Town), Hackney (London Fields) and so on, where progressive proposals from boroughs for area-wide traffic reduction in residential districts have been defeated by opponents. But, judging from consultation results, and also conversations I have with politicians, we do have consensus that main roads should allow protected space for cycling. 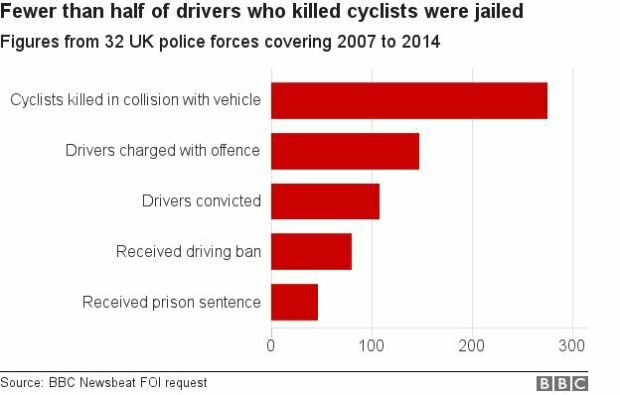 We need the calmed neighbourhoods as well, of course, for many reasons beyond cycling, but it looks like being a while still before that argument can be generally won. Then again, a main point about the 2012 campaign was we were trying to influence the Mayor, and he controlled not the neighbourhood roads, but the major ones. So it made sense for the campaign to be calling for stuff that he could bring about directly. 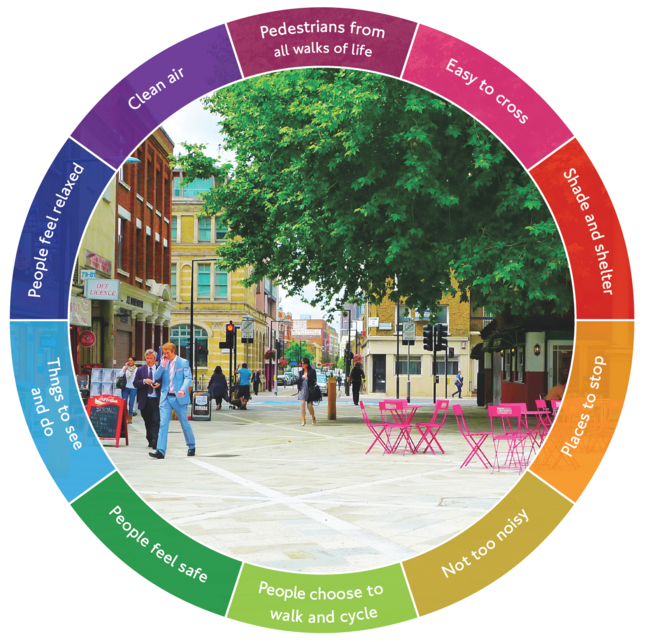 The point about the main road treatments is they really do generate new users, they get people out of their cars and off the buses and tubes, and start to build up the mass of influence we need to get the other, more difficult changes through. That's why attempting to start with the other stuff wouldn't be very effective. That's why I stressed in the video: This is the first step to generating a real, mass cycling culture. 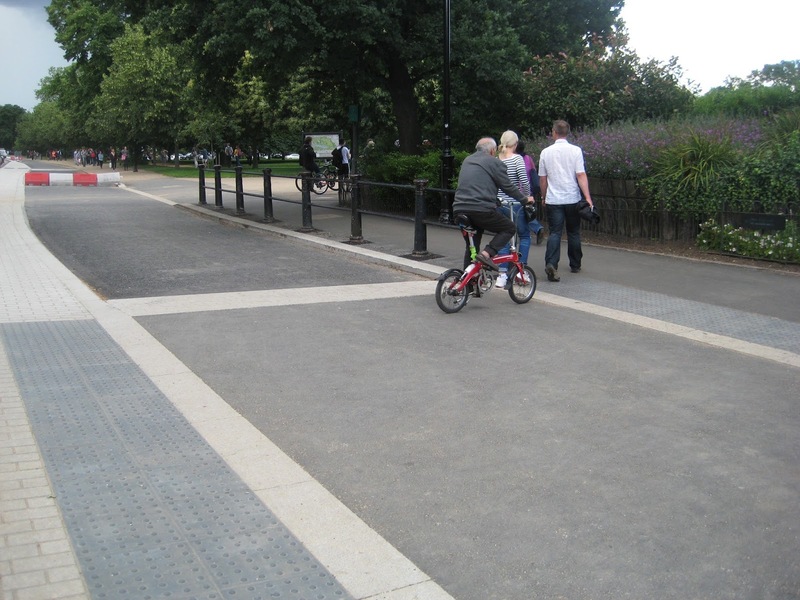 The propaganda power of the cycle track carved in granite out of what was previously space ruled by motors is huge, and immediately comprehended by those who have never thought about this subject before, in a way that filtered permeability just isn't. In other words, as Paul Gannon said to me back in the last century: people cycling on separate tracks on busy roads make other people think I could could do that too to a far greater extent than any other engineering measure or piece of promotion does. The proof of all this seems to me to be amply demonstrated by what we see on the roads of Central London today. 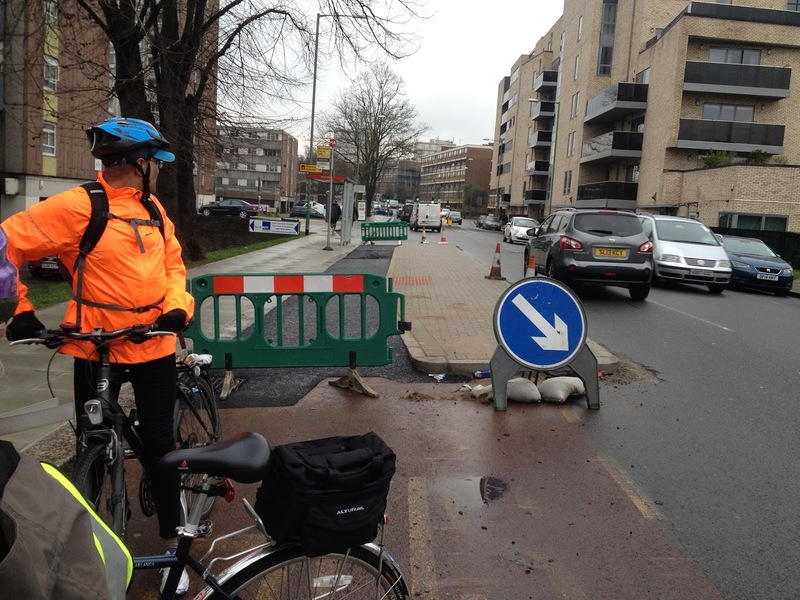 Mind you, I never expected to see the scene that was videoed by Wayne David last Saturday at the Embankment, site of the East-West Cycle Superhighway, the route for which I first suggested to Andrew Gilligan, the future Mayor's Cycling Commissioner, in 2012. In this event, a seven mile circuit of central London streets is given over exclusively to bikes for a few hours once a year, cyclists are dressed up like yellow canaries for no apparent reason except to unwillingly advertise Sky Sports, and a huge number of obstructive barriers is erected around The Mall to prevent anybody from conveniently walking anywhere, enforced by a huge number of paid-for-the-day officious event staff who shout orders at you and tell you what a good time you are having. To expect Sky Ride to encourage more people to cycle under everyday London traffic conditions is like expecting the experience of taking a cross-channel ferry to encourage people to swim the channel. It unrealistic, as the conditions are so profoundly different. But from where I sit now, having seen the changes since then, I reckon I was a bit harsh. Perhaps these events, though demonstrating the suppressed demand, did contribute to generating the political pressure that brought our present infrastructure programme into being. And, strangely enough, I am quite looking forward to this weekend's event. 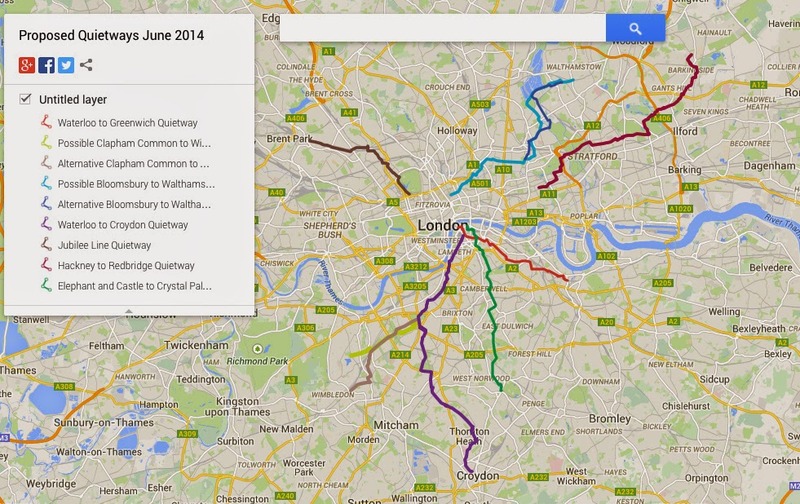 It looks far better than ever before, with a route that does not use the same roads there and back, as in the past, but is a real loop round, with various interesting alternatives to explore, using in part the new East-West Superhighway, but closing a lot of other roads to motor traffic besides. 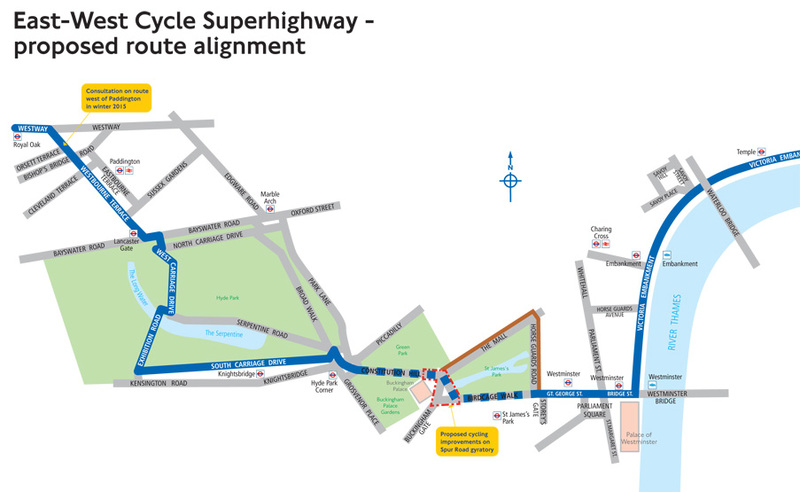 And, of course, if you are lucky enough to come from an appropriate direction, you can use a Superhighway to get there. Maybe I will see you there. Look out for the Vole! 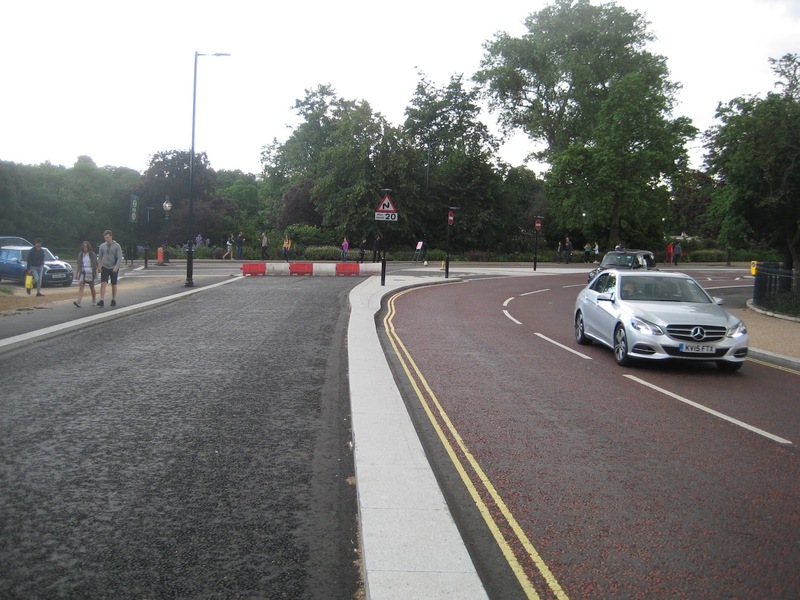 Construction of the East-West Cycle Superhighway (or CS3) in London has been continuing, and the sections on the roads in Hyde Park are nearly built, and to pleasing quality. 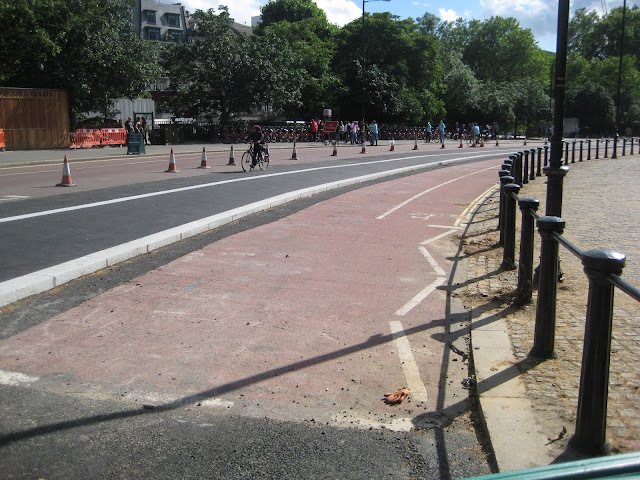 From the already-famous section on the Embankment, which opened on 6 May (the opening was Boris Johnson's last act as Mayor of London) the route is programmed to go via Bridge Street, Parliament Square and George Street (already constructed) via a new path on Birdcage Walk by St James's Park, a new bollard-segregated section past Buckingham Palace (mentioned in this post), and an upgraded path along the margin of Green Park in Constitution Hill, to the crossing of Hyde Park Corner, and thence along South Carriage Drive in Hyde Park. It will then turn sharply north on to West Carriage Drive (wrongly labelled as 'Exhibition Road' in TfL's own diagram, below) and exit the park at Lancaster Gate. Rather than change this poor design in Broad Walk, the authorities have chosen to built a new high-quality route along the South and West Carriage Drives (which already had cycle facilities, but poor ones). This is in many ways a good thing. 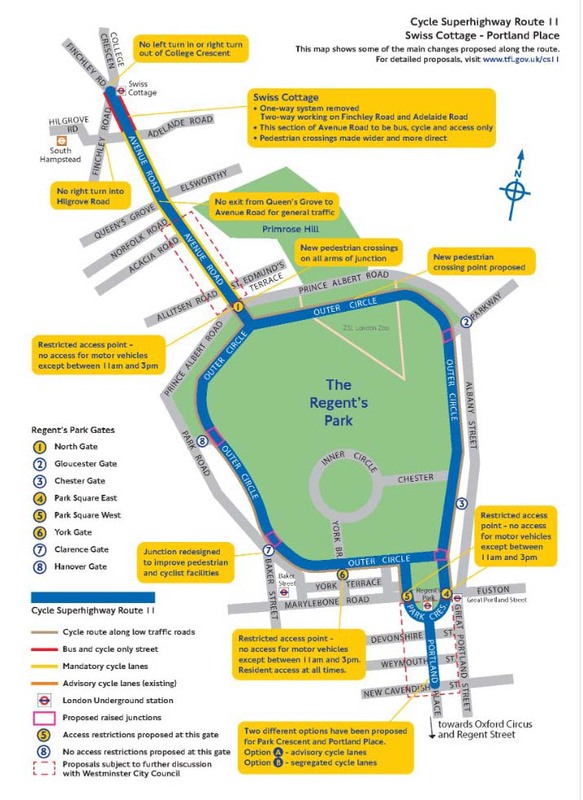 It creates a high-quality, high-capacity motor-traffic-free connection from Hyde Park Corner to Kensington Gardens and South Kensington (Exhibition Road) to replace the far too narrow, existing line-segregated path along the south side of the park. 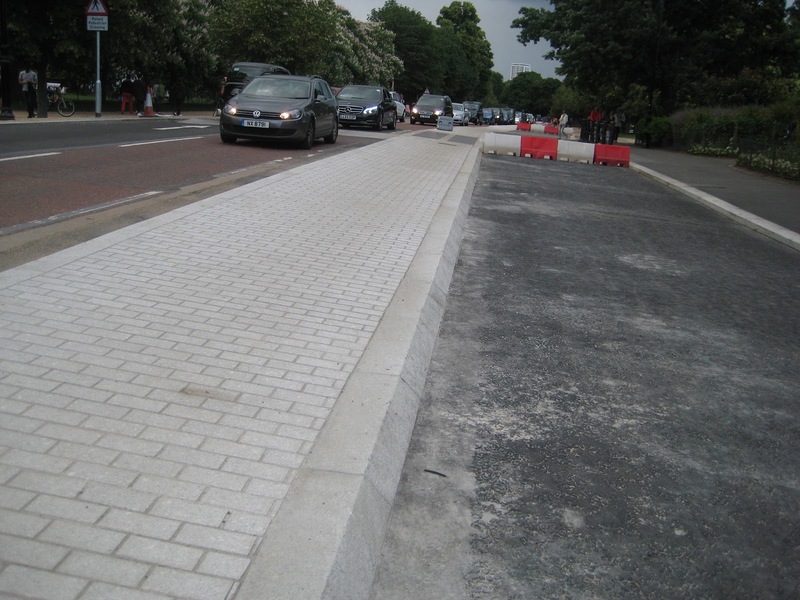 At the same time it benefits walkers, taming the rat-run of South Carriage Drive and taking flows of cyclists on the east-west axis well away from flows of pedestrians. 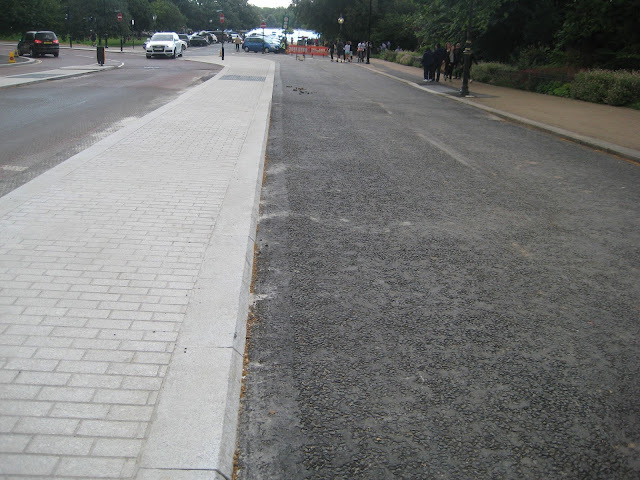 The work on West Carriage Drive is also, in itself, welcome and long-overdue, replacing the strange and illogical mixture on on and off-road 'facilities' on different sides of the road that existed before, and creating a top-quality cycle connection north-south across the park from Exhibition Road to Westbourne Terrace, linking South Kensington to the future western extension of the Superhighway. 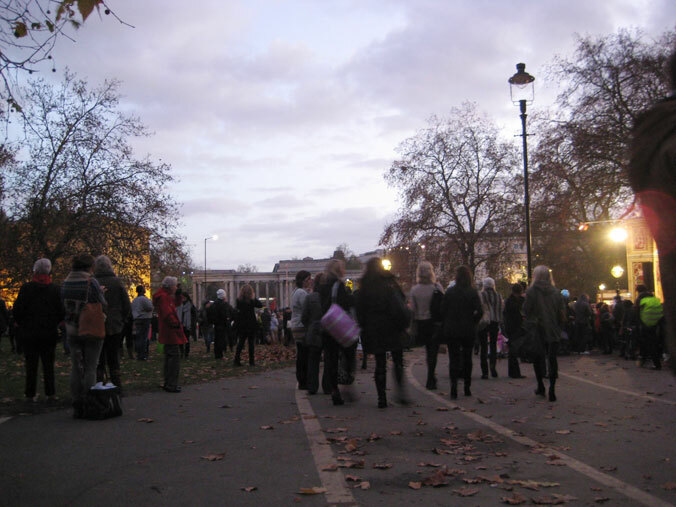 The old cycle path on Broad Walk does not effectively keep pedestrians out at busy times, and is often closed for events. Building work on South Carriage Drive in early July. 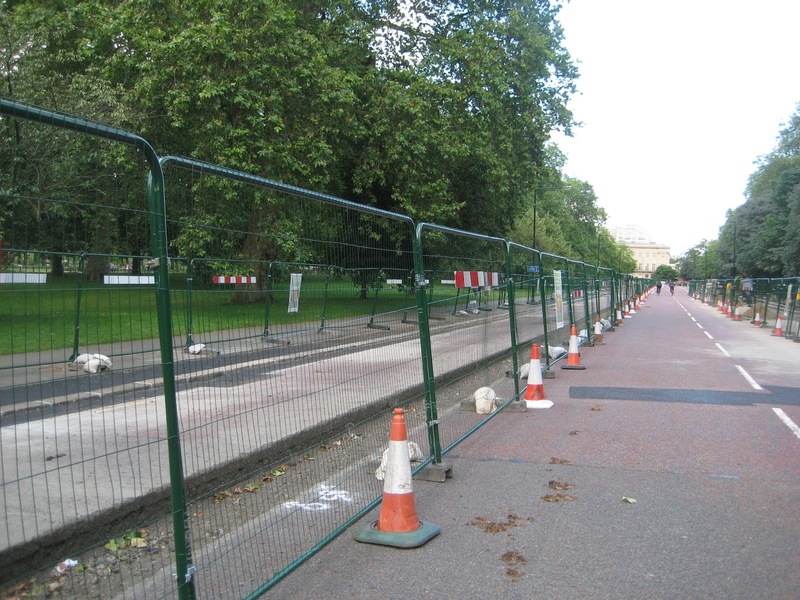 A swathe of road on the park side is being segregated off for a 4m wide track. The old pedestrian islands are going, along with the old cycle lane, and the whole road is being moved southwards (to the right) slightly. A completed section of 4m segregation on South Carriage Drive near Hyde Park Corner. The old cycle lane markings are still present and the red surface is old. Presumably it will be resurfaced. 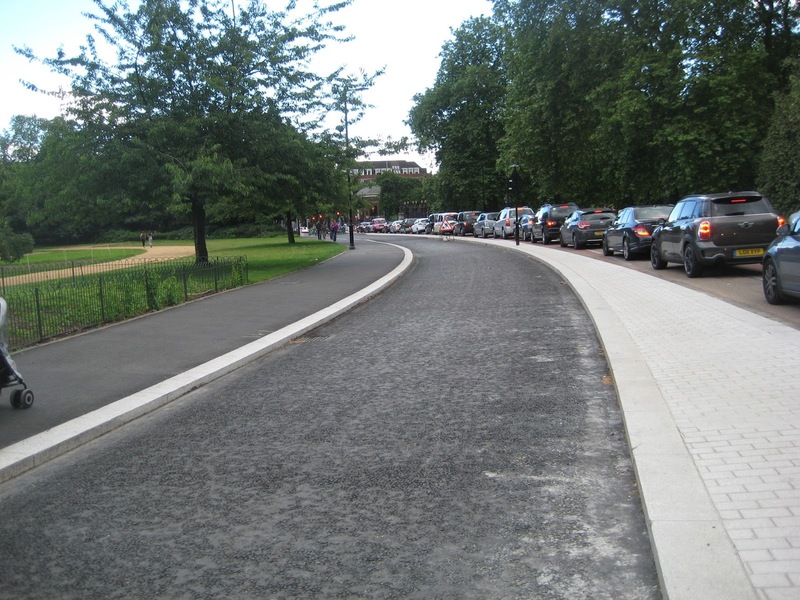 The track on the east side of the West Carriage Drive is largely complete and is 4m wide generally but widens to 6m at Alexandra Gate to allow for lanes for cyclists heading to and from Exhibition Road and cyclists following the Superhighway from and to South Carriage Drive. 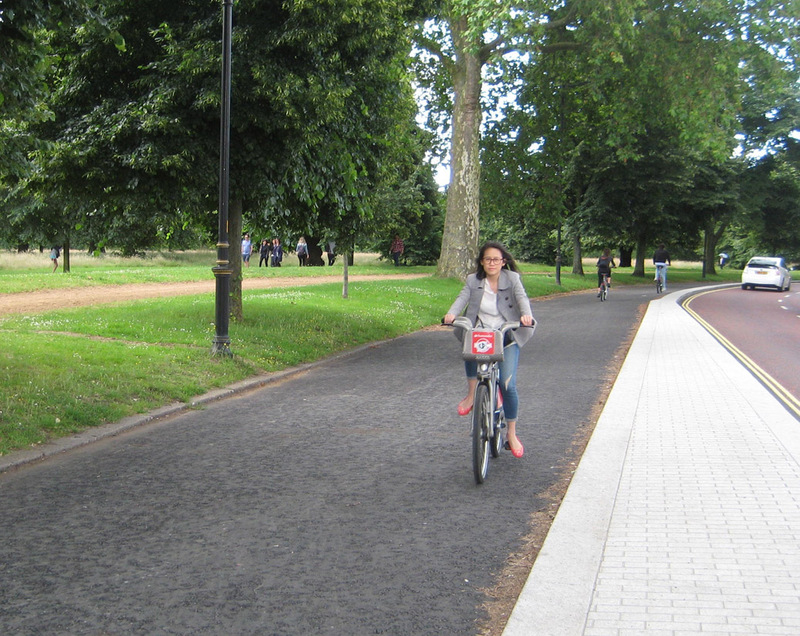 Charlie Fernandes (@Charliecycling) demonstrates the width of the track approaching Alexandra Gate (Exhibition Road). 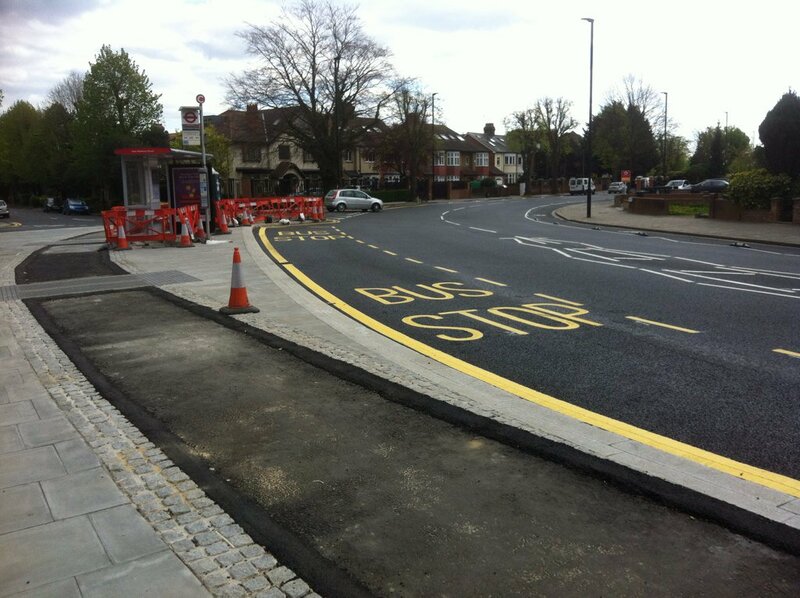 The pavement has been rebuilt and the old, poor on-pavement cycle track is gone. A chamfered kerb has been used here, which is good practice, and in the distance a table runs across both cycle track and carriageway at a pedestrian crossing point. Detail of the speed table on the track. The ramp has cobble-ish stones but is fairly benign. 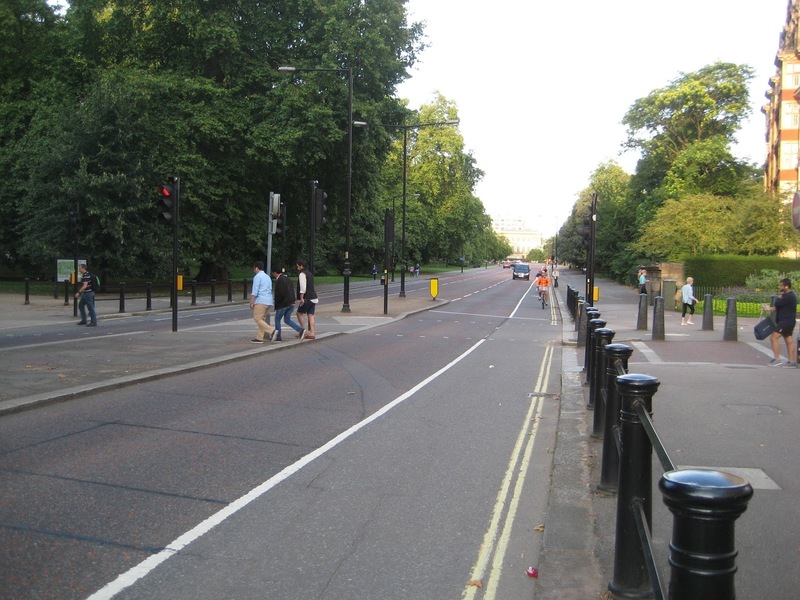 I don't know why a zebra crossing was not used; are Royal Parks are antipathetic to these? The same viewed from the north. 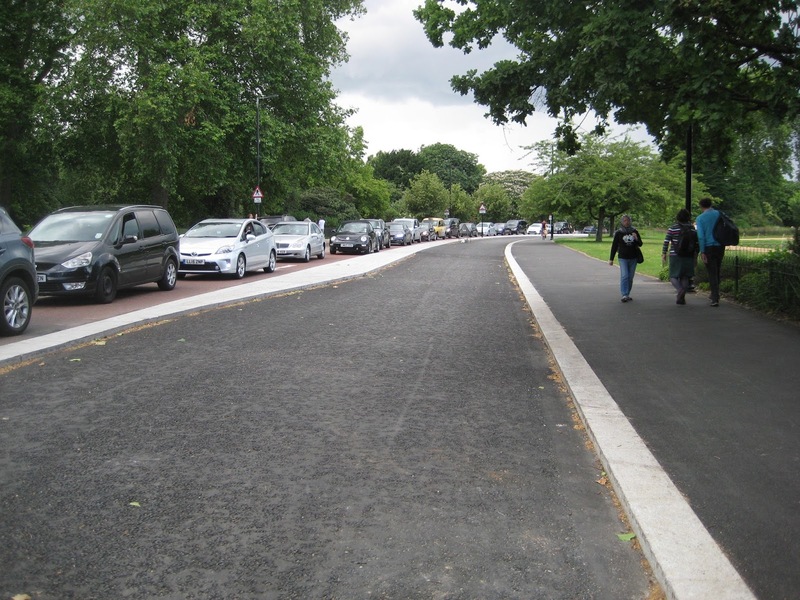 An odd thing has occurred her in the cycle track having a black machine-laid surface, but the carriageway being reddish, as is often Royal Park's practice. The colours are thus the reverse of the Dutch convention. When I viewed these facilities in early July they were not yet open, though of course cyclists were trying to use them. The building of the linkage through Lancaster Gate, a hitherto highly unpleasant racetrack gyratory and major blockage on the cycle network, had not started. I believe work in Westbourne Terrace, further north, has started, however. 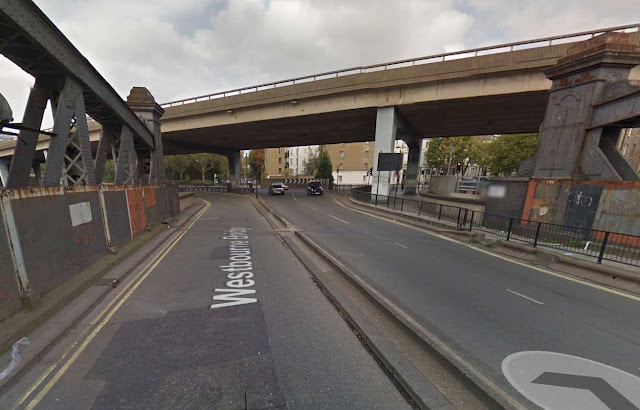 This is the last part of the Superhighway that is currently approved for construction. In April consultation took place on the next section, taking CS3 (and the Superhighways) firmly into West London, via the elevated Westway section of the A40. This idea, by Johnson's cycling commissioner, Andrew Gilligan, was not universally welcomed by cycle campaigners, who generally would have preferred a more accessible and humane route on the surface, but I supported it, as, due to the obstructiveness of the Royal Borough of Kensington and Chelsea, who seem to have a horror of the idea of cycle tracks on their roads, there was really no alternative for westwards continuation at that time. 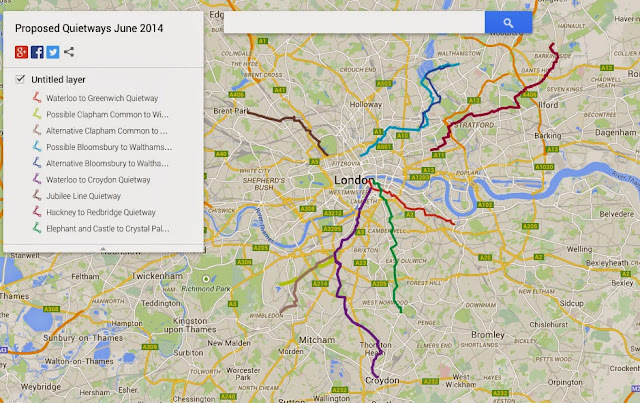 Transport for London have jurisdiction over the A40. 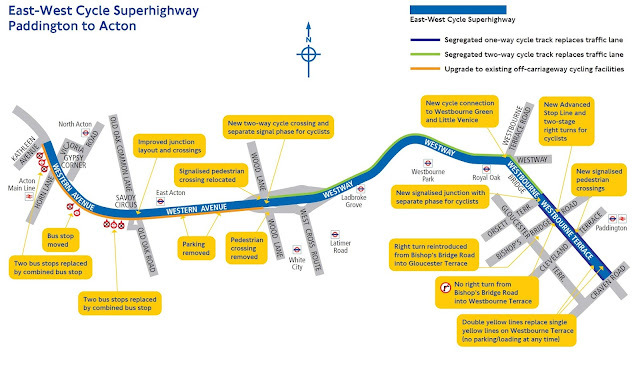 We await a decision by the new Mayor Sadiq Khan on the continuation of CS3 on the Westway, as well as the northward continuation of CS6, the North-South Superhighway, from Farringdon Road to Judd Street, and the commencement of works on CS11 from Portland Place to Swiss Cottage. All these were consulted on earlier this year, and, despite the vicious campaign against CS11 that I reported on, all secured a high level of public support. 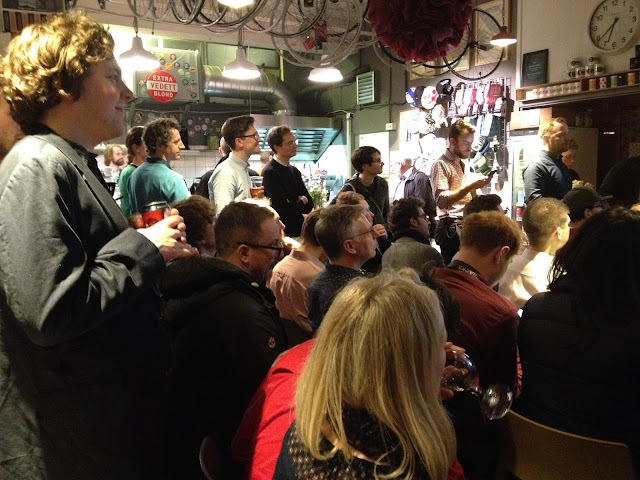 Khan must now start to make good his election promise to 'Make London a byword for cycling'. So far we have only heard generalities from him (except for a commitment to create a new walking and cycling bridge in East London and a commitment to pedestrianise Oxford Street, which may or may not work out well for cycling). He has also not yet appointed a successor to the highly-successful first Cycling Commissioner for London, Andrew Gilligan. Caroline Russell, Green London Assembly Member, has reported that this job, which is to be re-badged as 'Cycling and Walking Commissioner', is to be advertised soon. I am worried about this. The Cycling Commissioner post that Gilligan occupied under Johnson was a political post, as it needed to be. The job was not advertised because it needed to go to a political ally of the Mayor for the role to be effectively accomplished. In, Gilligan, an ally of Johnson, and indeed a friend, political heft was combined with diplomatic capability and a great deal of knowledge about cycling in London, with a recognition of it as being generally dreadful, and a determination to knock political and bureaucratic heads together in order to change things. A journalist, and thus an expert at publicity or propaganda, Gilligan was not a technical expert but understood enough technicalities to challenge experts when they stood in the way of progress, and was able to work with campaigners, if not always in complete harmony, then with a constructive friction; a kind of double-agent if you will. Advertising the post of Cycling and Walking Commissioner suggests it is to be be downgraded to a technical role. A technician is likely to be ineffective in this highly political position. But we will have to see; I hope my worries on this are unfounded. They could be, with someone who is an expert in the post of Commissioner, but a strong driving force from the Mayor and Deputy Mayor for Transport. I suppose Gilligan could re-apply for the job; he is clearly the most qualified person to do it. His report on the progress of the first three years of The Mayor's Vision for Cycling, Human Streets, is worth a read. While the segregated Superhighways have been the massive success we knew they would be, they are still far from where most Londoners live and work. They only represent the bare beginnings of a functioning cycle network. It would be a crime for momentum to be lost and for the the expertise now built up within Transport for London in building high-quality, effective cycle infrastructure to be dissipated, which is what will occur if we do not rapidly have a plan for expansion of the network, in all directions, beyond Zone 1. 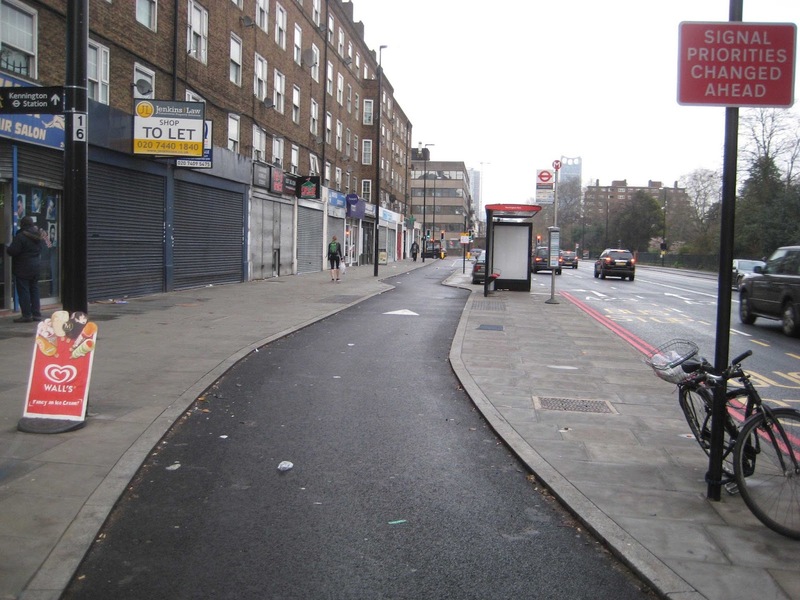 Khan has popular, fully developed 'shovel-ready' schemes at his fingertips in CS3 as far as Wood Lane, CS6 as far as Euston Road and CS11 as far as Swiss Cottage. He needs to approve these now, get his Commissioner in place, and produce the detailed plan for the next four years. He has been busy, of course, with the EU referendum, and, in the aftermath, with pressing the government for new powers to allow him to keep London as closely linked to Europe as possible; these were the right things for him to be doing, and the strategic and financing powers he is seeking, if he is successful, can only be good for continuation of the cycling programme and modernisation of the streets generally. In particular, he needs far more authority over the infrastructure currently controlled by the boroughs, the Corporation of the City of London, and the Royal Parks. The lack of this authority is pointed to in Gilligan's report as a major reason why progress on the Mayor's Vision has not been faster. Nevertheless, Khan should not repeat Johnson's mistake of moving slowly, being in office for eight (or four) years, and scrambling to try to build a world-class cycle network in the last few months of that. I went for a nice walk in Central London on Saturday. It was great to be in the sunshine and showers, slowly ambling past the architectural treasures and follies in the historic heart of our democracy at Westminster. The experience was rendered infinitely more pleasurable by the fact that the authorities had, for some reason, decided to ban all traffic in those streets for the day – even (shock, horror) bikes. So the air was clean and there was no threat of getting run over, even walking in the middle of the street. It wasn't as quiet as you might have expected, however, as 30,000 other people had decided to do the same thing. And some of these people had trumpets and other noise-making gadgets (and I realised for the first time exactly why it was that, historically, the trumpet was always the primary instrument of the army). 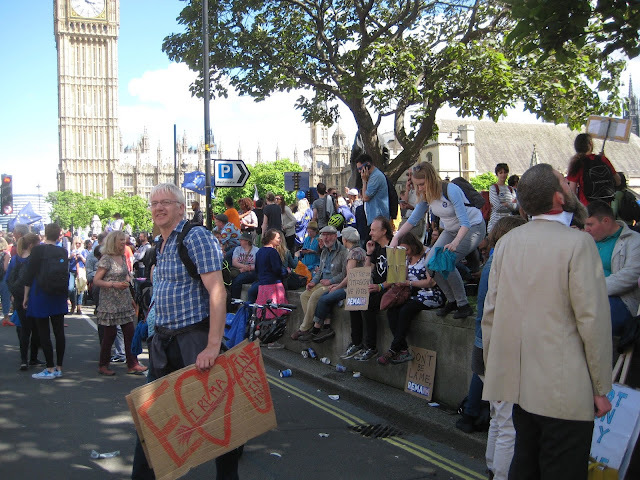 This was clearly a family day out for many, and the huge crowd was good-natured and boisterous. Many of these walkers had created very clever posters lampooning the politicians who led the campaign for the UK to leave the EU. 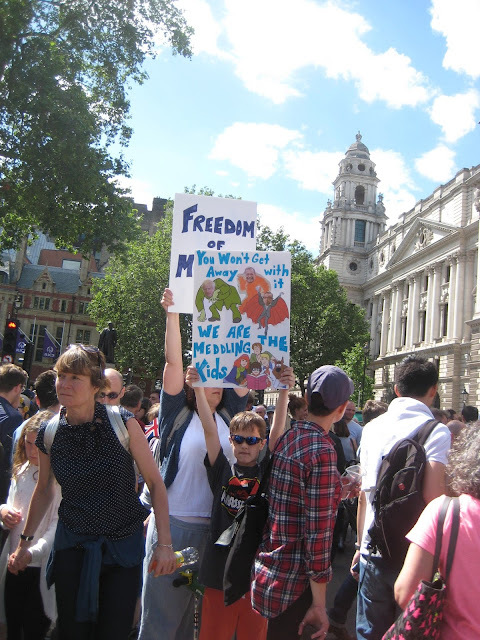 I think my favourite was the one paraded by some children referencing the Scooby Doo cartoons. With Gove, Johnson and Farage dressed as fake spooks, it stated You won't get away with it, we are the meddling kids. 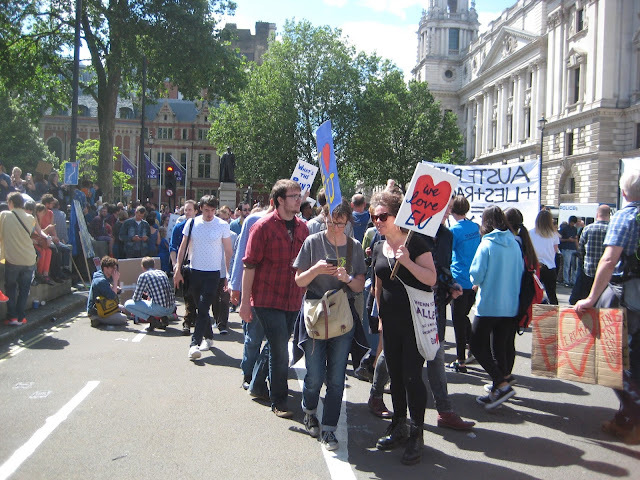 Some of my acquaintances, even left-wing people, actually disapproved of this march. They called it 'anti-democratic'. 'We've had the referendum, we didn't like the result, but that's it, we've got to live with it, that's democracy' went the argument. I beg to differ. I think we have a duty to continue to campaign, if we really believe that Brexit is so wrong, in particular to defend some people who may be rendered vulnerable by the result of the referendum. Majority votes have the potential to damage the weak if the question asked is a bad one. That's why generally why we don't use referendums, we use representative democracy through Parliament. Additionally we have a high duty to European peace and solidarity, if we truly believe that that is what the EU is ultimately about. If we believe the 52% got it badly wrong, it's our duty to go on saying so. The constitutional position is fairly simple. The referendum was only advisory, and Members of Parliament, have, as I stated in my letter to my MP, the duty to take not just the referendum result, but all the circumstances, and all their best judgement about what is best for the nation, into consideration in coming to their decision as to whether to allow the UK to secede from the EU. 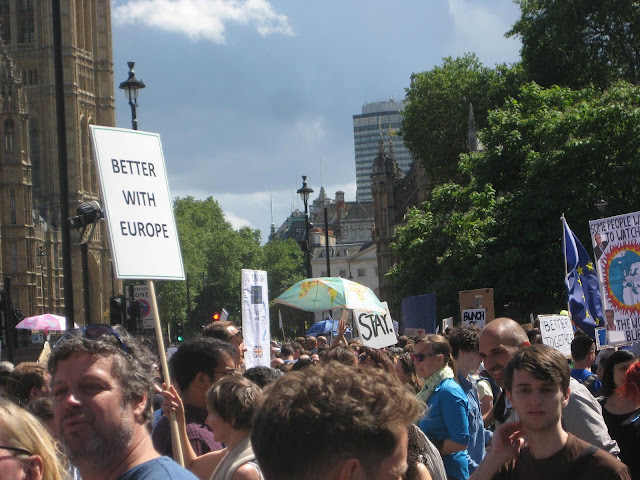 It's totally legitimate for the Remain supporters to go on lobbying parliament to try to convince them that we should not leave the EU, for many and various reasons, after the vote has been counted, and even after we start to leave, if we do, to continue to lobby to reverse the process. This isn't anti-democratic. it's fully a correct part of the democratic process. 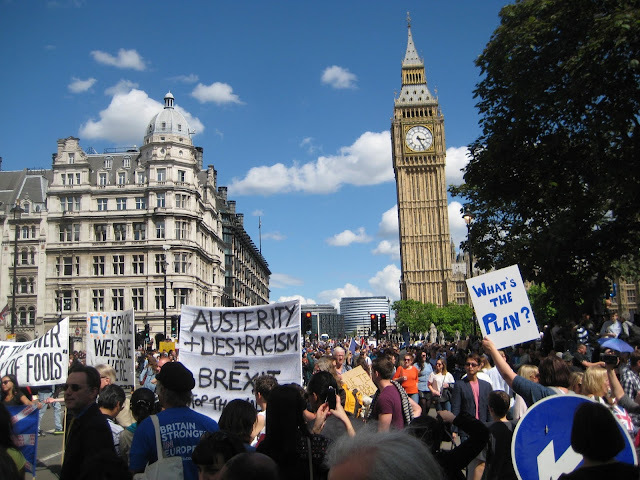 If an MP was on the losing side of a vote in the House of Commons on a subject that he or she cared passionately about, no-one would be surprised if he or she continued to try to persuade fellow members of their point of view on the subject and to agitate for a further vote. Many important reforms have historically come about in this way: the principle was lost first time round but succeeded in the end. 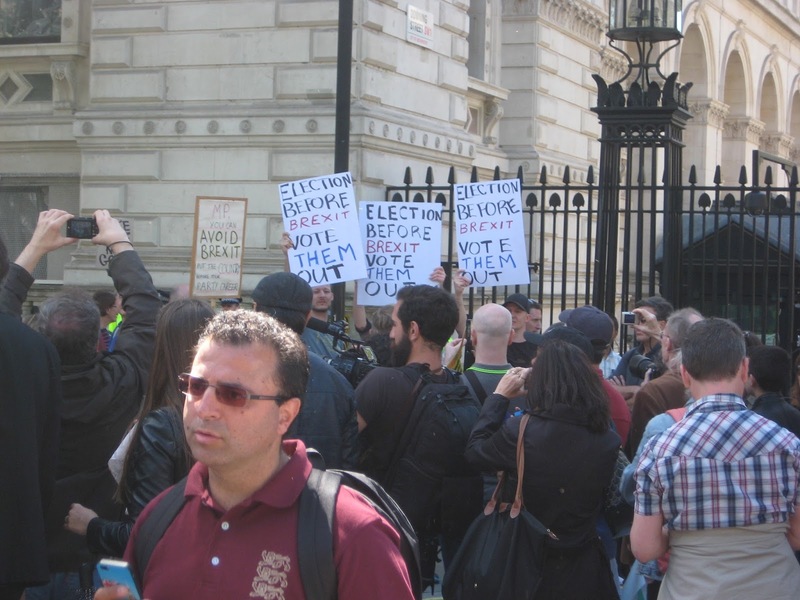 No-one would argue this is an undemocratic process in a legislature – why so if amongst members of the public after a referendum? I would expect the supporters of any cause who believed in it strongly, even the Leave camp, if events were going against them, to do the same. Ultimately, of course, the objective is not to make Parliament take an unpopular decision. It is for the populace to realise that they got it wrong first time round. Public sentiment and politicians' minds need to be turned at the same time. 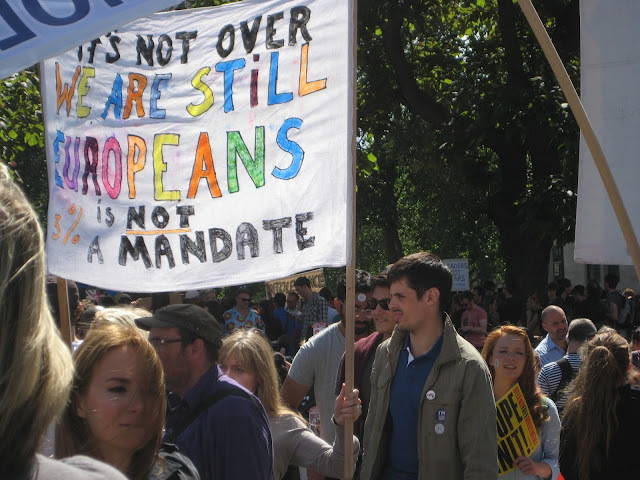 But in the shorter term, before most people realise that Brexit is wrong, there's another relevant argument: 48% simply isn't a mandate for the scale of destructive change that will be brought about. 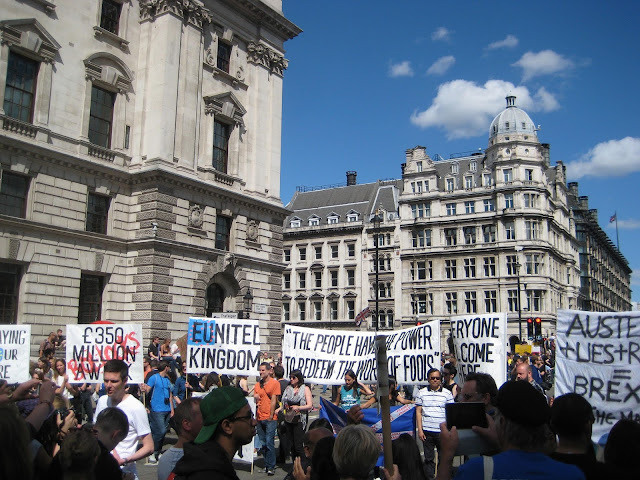 As many have pointed out, it is normal in not only developed political systems, but in voluntary organisations, for change to the constitutional status quo to require a supermajority of 60%, or two-thirds, or majorities simultaneously in two levels of government (for example in all devolved authorities as well las the central one). Such a stipulation wasn't put in place in this referendum, though it was in the first Scottish and Welsh devolution referendums. Instead all we have is the discretion of MPs to call upon. I'm not over-optimistic about the effect that a march of 30,000 people will have. 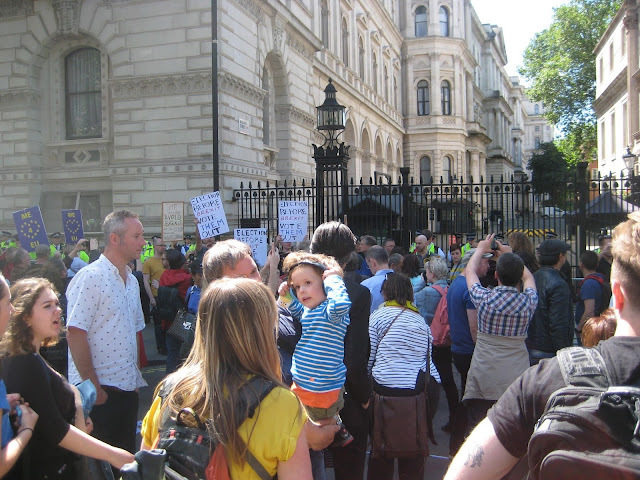 The Stop the War protests were bigger, and they didn't stop the war. But protest is an essential element in the combination of levers the ongoing Remain campaign will need to use turn this around. There is an important difference with the Stop the War movement. The war was inherently self-limiting, as the people will not stand for an indefinite foreign military involvement. Marching may not stop a war, but may bias the politicians to pull out more quickly. Separation from the EU just goes on once triggered, and the period for campaigning about it is indefinite. The arguments by the Remain side will become ever more convincing with time as the problems with separation ravel up in ever-more tangled knots, growing more intractable as they are further examined. We are seeing this currently as the Conservative party debates who will be the next Prime Minister. Now the EU emigrants in the UK and UK emigrants in other countries have become the political pawns in the Conservative leadership contest. 'Give everyone working here the right to remain' some say. 'No, we need to use them them as a bargaining chip against the other states where are own expats are' say others. So the lives of both their expatriates and ours are tossed about by these politicians in their own game. The truth is it isn't possible for the UK government to give a guarantee about the EU nationals here because they can't be confident of getting a reciprocal deal from the EU. The truth is that the EU will not want to offer such a deal quickly, if at all, because the UK has to be seen to be punished for separating. 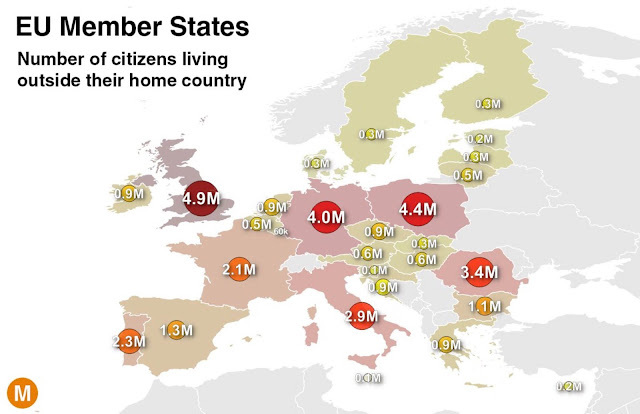 The further truth is that some states in the EU probably would not be that averse to no deal being achieved, ever, and mass repatriations resulting, because in due course the expanding economies of the East European states might well need more of their workers back, and the Spanish and Provençale authorities may be quite happy to get rid of the burden of a large number of elderly British from their healthcare systems. Recall that every member state will have a veto on the final deal reached. The worst deal for Britain is the one that will take it. The UK is the biggest exporter of people in the EU: we have most to loose from negotiations on 'right to remain'. It's not clear to me that the Bexit campaigners thought any of this through in advance. There is one huge, critical question that none of our pro-Leave politicians are asking, as French commentator P Y Gerbeaux (spelling?) commented right at the end of Radio 4's Westminster Hour this week (after recounting how many EU immigrants in the UK are now feeling scared and alienated): What hasppens if, down the road of the Article 50 process, all the UK negociators can get out of Brussels is a deal that is terrible for the UK? What happens if what the UK is offered is trading terms less favourable than those offered to Turkey, plus an insistence on full freedom of movement, plus fees? The UK then has only two rational course available: leave with no agreement, in which case we might get our 4.9 million mostly elderly nationals back pretty quickly, which will do wonders of our health and social care bills, or stay in the EU on current terms (if the other states unanimously still want us, which seems doubtful). The likely real results of negotiations are seen in the actua example of Switzerland, which did have a binding referendum on limiting immigration, which the Swiss government has not been able to implement because it conflicts with trade agreements with the EU. The Swiss example shows how a favourable al la carte European relationship won't be possible. We'll either end up in a very subservient relationship, as Switzerland is now finding itself in, or with no more relationship with the EU than, say, Russia. The fundamental problem with the concept of Brexit, is, and always has been, that it doesn't mean any one clear thing. That was the main difficulty with asking the populace to vote on it. The referendum asked a bad question. The EU is a continually evolving entity, shaped by it's member states and their government's policies. What Brexit means this year is different from what it might mean in the future. But there are several things we can say it definitely does mean. It means our government does not send any Commissioners to Brussels. It means our people do not elect members of the European Parliament. It means our ministers are not part of the EU Council of Ministers. It means our representatives are cut out of the decision-making of Europe. On the other hand, Brexit does not definitely mean control over our borders, and it does not mean definitely no contributions to the budgets of European institutions. Far from meaning 'taking back control', in most likely scenarios, Brexit amounts to a desperate loss of control. How did this state of misunderstanding arise? It seems to go back to a kind of post-Imperial British feeling of entitlement and inflated self-importance. We're still a nuclear power after all. We may have the second most impressive lot of aircraft carriers in the world by 2023 and we're still at the top table of the UN in the Security Council. There's been this feeling all along that Europe needs us more than we need them; an arrogant conceit that we, the anglo-saxons, are still going to show those failing Eurocrats exactly how it all should be done. 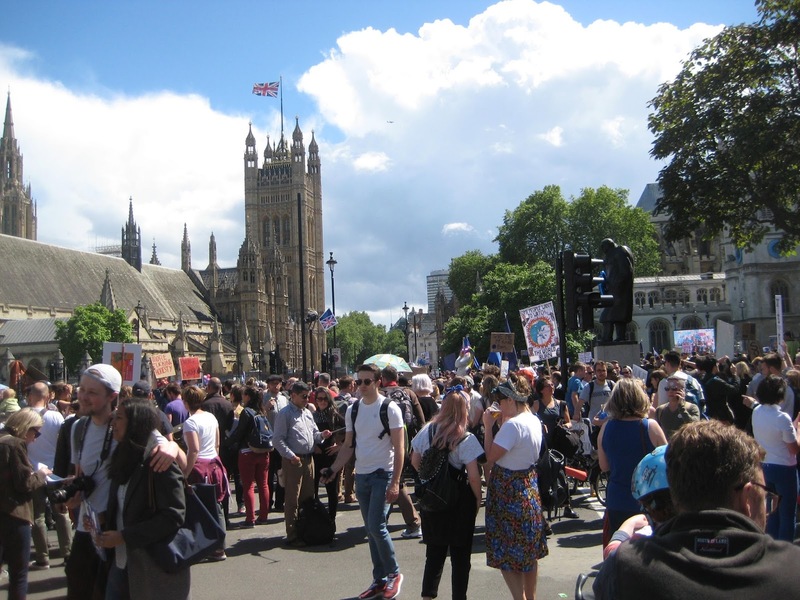 So on Saturday protestors filled the pavements, carriageways and cycle tracks of London, clambering over the brand new granite kerbs of Cycle Superhighway 2 in Parliament Square to push for a different, more realistic course than the one the 52% chose. I will leave the EU debate and go back to discussing cycle infrastructure in my next post. Some divisions are bad, but kerbs are OK.